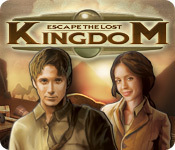 Escape the Lost Kingdom is rated 3.8 out of 5 by 16. Rated 5 out of 5 by AdrianaIP from Great family fun A nice game with no demonic elements, nor fireworks. Just follow different characters (the same chapter is played in three different versions. The settings are a bit monochrome, but it is supposed to look that way, inside a pyramid, The HOS are few and not too hard. The minipuzzles are interesting, and in keeping with the theme. Ancient Egypt is always worth revisiting, and this is a nice excursion with no macabre themes. Rated 5 out of 5 by Sergeij from A Triumph And HO Clinic as GOJII GAMES Shows Us HOW! 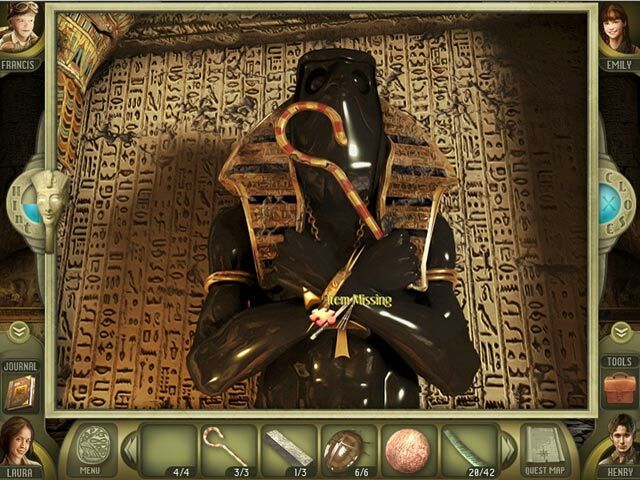 This game was riveting from beginning to end, and, even if you're NOT a lover of Antiquities and Egyptology, you'll love this game, nevertheless. Gojii Games used its HOS sparingly, and they didn't take long to figure out. I really liked that. Other developers could learn a lot from Gojii Games by examining their hidden object areas. As for the game, itself, it finds a husband and wife, kids and cat, taking a tour of Egyptian Antiquities only to get trapped inside the pyramid and burial place of a lost King of Egypt. They get split up and must find each other by going through secret passageways, breaking down and blowing up walls, and solving many, many fascinating puzzles. I could go on and on, but I must say that this game is a "must buy!" Great graphics and music. Good voice-overs, and an excellent storyline all decorate this exciting game. I loved it! Rated 5 out of 5 by Rebr2009 from Very entertaining and interesting game. A family goes to Egypt and break apart because of a curse. You will help bring them together. For this you can choose which character you will play - and each has something that helps: the mother and father, Laura and Henry have tools and diary; Francis, the son has googles with glyph vision and Emily, the daughter has a time amulet . Great story that takes place in Historical Egypt, in the pyramids, sphinxes, etc.. Really interesting. Excellent VO, good sound, very crisp and well done graphics, really good atmosphere. Good amount of HOS and mini games, average challenge. You can disable help (tips that appear at the top of the screen). Really pleasant game, provides great fun. Rated 4 out of 5 by LunaNik from 4½ stars...stands the test of time. Eight years later, and this HOPA was more enjoyable than most of today's formulaic cookie cutters. The storyline was well-developed and executed perfectly. Two storylines, actually, which are intertwined. In the present, Mom, Dad, Emily, and Francis become trapped in a pyramid after trying to rescue their runaway cat. Even worse, they become separated. In the past, a forgotten pharaoh who was entombed by his evil brother is waiting to be freed. Meanwhile, the brother has filled the pyramid with traps and puzzles, all of which must be solved. Each character had a distinct personality, and the voiceovers were excellent. For exploration, you have a journal to store clues, a collection of tools, an amulet that allows you to see what each room looked like in the past, and goggles that reveal an area of interest. And you get to play from three viewpoints: Mom (with journal) and Dad (with tools) together, Emily (with amulet), and Francis (with goggles). While there are none of the modern bells and whistles, like character animation, this game doesn't need them. Gogii wisely put its time and energy into the story and gameplay instead of the "ooh...shiny" that devs use to try and mask an insipid game. There are lots of HO scenes, all of them either straight list or multiples. While the presentations are limited, the objects are hidden, so these are much more of a challenge than today's HO scenes. Puzzles are varied, interesting, and range from easy to medium difficulty. I recall enjoying this game when I bought it in 2010, and I enjoyed it just as much in 2018. It's not a long game, so I recommend using a PCC or waiting for a DD. Rated 4 out of 5 by rosekaufmann from LOTS OF FUN Lots of fun to play. Average length game divided into 5 chapters. Logical game play. If you have spare 3D glasses lying around, you can get the 3D experience. Play 3 characters as you explore the museum, looking for the lost family cat: Emily, Francis, and the parents, in whatever order you wish. Mom maintains the journal, dad has the tools, Francis has glyph vision which lets you see the active parts of a scene and Emily has a time amulet, which lets you see the past and help solve puzzles. There is a map and “location cleared” appears once you’ve done everything in a scene. Voice acting is natural and believable. Puzzles are fairly easy, although you will need to use the amulet or glyph vision or consult the journal for the solution. At first it was confusing only being able to play one character, chosen at the beginning of each chapter, but after a while, it became a lot of fun. I chose a different order for playing the characters the second time I played. It can make the difficulty seem different. Ending was satisfactory except we don’t know whether the cat was left in the museum. Rated 4 out of 5 by Hookedonbigfish from Good adventure game - plenty to do. I thought this was a very good adventure / hidden object game with plenty to do. There is a lot of back tracking between scenes to find items that are needed to complete a previous scene and so progress through the game. 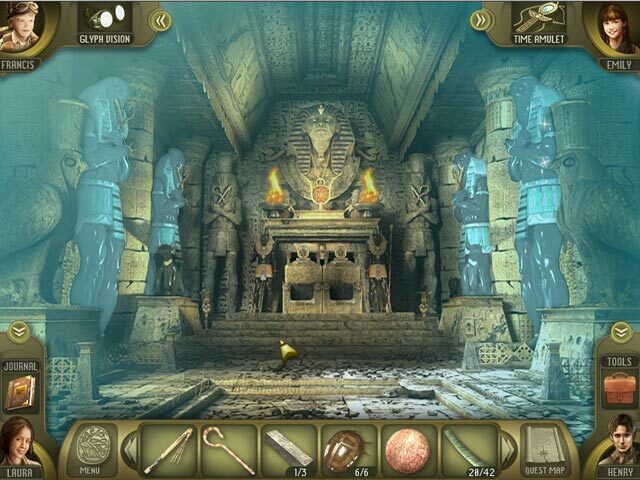 After a cursed Pharaoh traps a whole family in a newly opened museum, you have to play as each member of the family to navigate the spooky tomb and eventually free them all.The voice overs are great at narrating the written dialogue which saves a lot of reading.The graphics are clear and colourful and there is a handy notification when each scene is cleared and each level is completed. The puzzles are quite simple and mainly straightforward but a few require a bit more thinking. The maze is rather challenging. 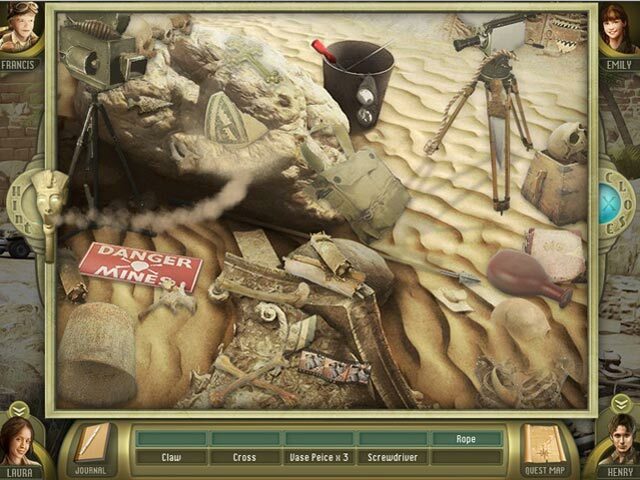 The hidden objects are reasonably clear and most of them are easy to locate. Only a couple required a hint. I only used the walkthrough blog a couple of times. All in all a very satisfying and interesting game. Worth the money to buy. Rated 4 out of 5 by scoobydoo223 from Fun-Filled Hidden object It's really a good game to play and kind of learn about different egyption items that they used back then and now.If you like history you'll love this type of game.